Place all the ingredients into a large casserole dish. (If using kidneys halve them and cut out any tough white sinew) Pour in the stock and a little water if necessary. Cover, bring to the boils and simmer for about twenty minutes or until you are happy that all the ingredients are cooked through, particularly the potatoes. Drain off the liquid to another pan and simmer until reduced to about a quarter or third of the original amount. Add the milk and creme fraiche, stir well and season. Return to the main dish and allow to simmer gently for a further few minutes. 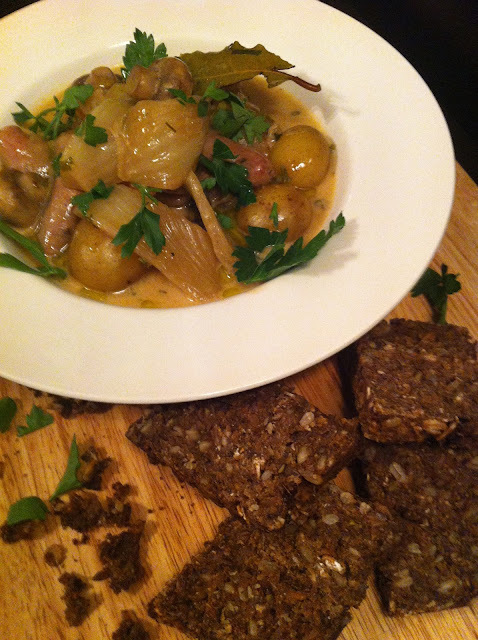 Serve with Irish soda bread and a garnish of chopped parsley .